The Circles are created, but they won't be available to other methods in your program. In fact, if you inspect your Picture Object on the bench, you'll see it has nothing to show. This is the first thing that should be fixed. Create a method changeCirclesColor that takes in a String color as a parameter. 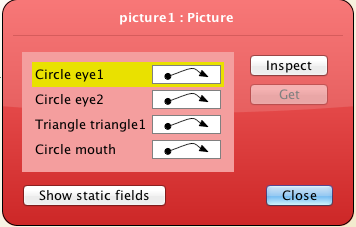 Invoke the changeColor method on each one of Picture's Circles and pass in color as a parameter. You should now be able to create a Picture and change the colors of all its circles at once. Result in ... ']' expected ... error in circles definition ? @Honzis, you should move your code to the constructor. Not Angry Birds, but... Angry Doggys here we go! Really cool stuff. At first, I wasn't crazy about using BlueJ, but everything is starting to piece together very nicely. Thanks! Currently there's no online question/check for this page since you do the coding on your computer. How do I get the checkbox for this page? I'm finished the unit... but I can't find any quiz on this page to finish. I just can't stand not having my checkbox checked!!! Just added a simple question so you can mark your progress.